While gum disease and diabetes may seem like completely separate conditions, research has shown that these two diseases can have a significant impact on each other—which can be bad for you as a patient. Here at the Arizona Periodontal Group, we want you to understand how to effectively manage both periodontal disease and diabetes. Here is a little more information about gum disease and diabetes, and how you might be able to ward off complications. If you are a diabetic, you might be familiar with the side effects of a constantly fluctuating blood sugar level. In addition to tracking your insulin, your doctor may have also prescribed lifestyle changes and emergency procedures—if that sugar ever gets dangerously high or low. Unfortunately, that blood sugar can also wreak havoc inside of your mouth. Because diabetes affects the way that your body handles sugar, diabetes creates the perfect environment for dental decay. For these reasons, diabetics are at a much higher risk for developing gum disease and periodontitis. Blood Vessel Changes: Diabetes makes the blood vessels of the body thicken, which limits the flow of blood inside the tissues of your mouth. Unfortunately, since blood vessels carry away wastes, these blood vessel changes can make it harder for your oral tissues to recover from infections. Bacterial Growth: Your mouth contains up to 25 different types of oral bacteria designed to harm your teeth. Unfortunately, since these bacteria feed on the sugars in your mouth, diabetic imbalances can exacerbate dental decay. Smoking: If you have diabetes, smoking is just about the worst way to complicate your illness. In addition to potentially throwing off your blood sugar levels and making it harder to breathe, smoking has also been shown to dramatically increase your chances of developing gum disease. In fact, research has shown that smokers who are 45 or older are more than 20 times more likely to develop severe gingivitis. Unfortunately, if your gum disease goes unchecked, it can eventually lead to periodontal disease, which can eat away at your jaw bone and make your teeth fall out. 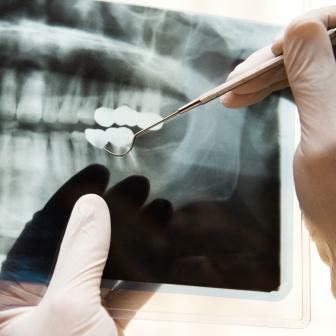 The bone loss that occurs during periodontal disease can even make it hard to get dental implants in the future. Do yourself a favor and take diabetes and gingivitis seriously. Manage your diabetes by eating right, exercising, and meeting with your doctor regularly. Make an appointment with our office to have your teeth and gums checked for the symptoms of gingivitis. By being careful, you might be able to protect your smile—and avoid complicating your diabetes.